The “old gal” drookit on arrival at the new bike-friendly Braco Coffee shop! Carrot cake and tandeming goes together like … well like Team Matilda’s Captain and Stoker really! And my dynamic crew’s love for a stop at a coffee shop for carrot cake has become a signature event of our rides. In fact I understand the unbeatable combination is now de rigueur for most tandemers! 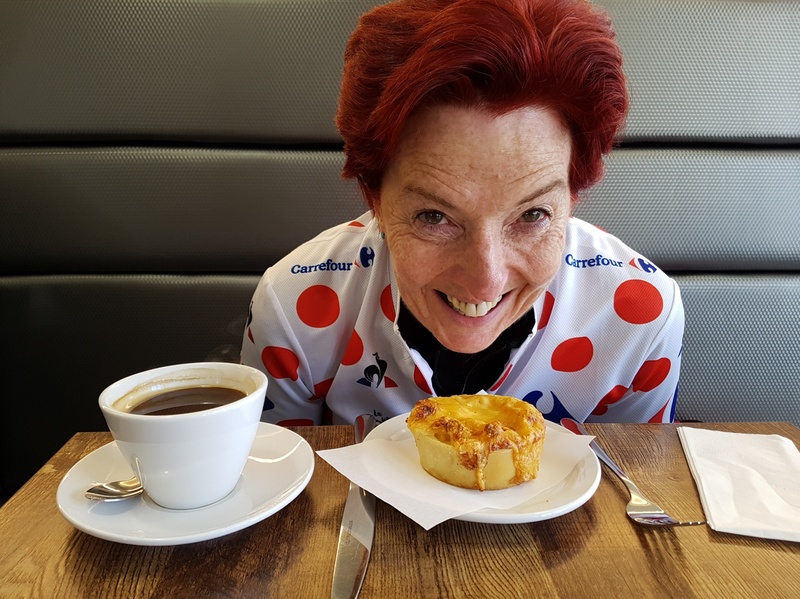 The “old git” and the “old gal” had been told about a great new tandem and cycle-friendly coffee shop in Braco and the plan for the day involved a pedal to build an appetite to sample the goodies on offer. But the plan came a bit unstuck in some heavy rain which stopped the planned route in its tracks, forcing us to quickly retreat to the coffee shop to dry out. Now as regular readers of my blog will know the “old git” is a bit of a zealot for checking the weather forecast with the localised BBC Weather service being his (usually) reliable first port of call. Dry and cloudy it said! But it was wrong! 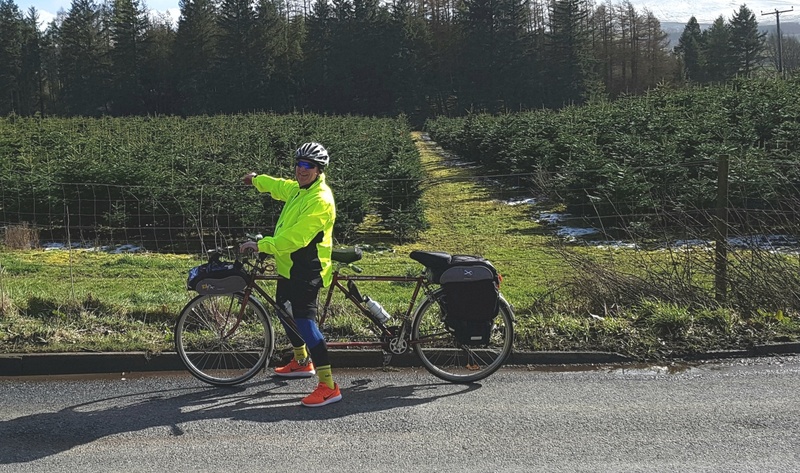 When we set out it was accurate and soon we were tandeming away from Matildas Rest out on the open rural Perthshire roads past Gleneagles Hotel and on to Braco. To be honest, the cloud was building at this point – as the “old gal” pointed out. But the “old git” in his role as Captain decided to press on with the planned route to Dunblane. 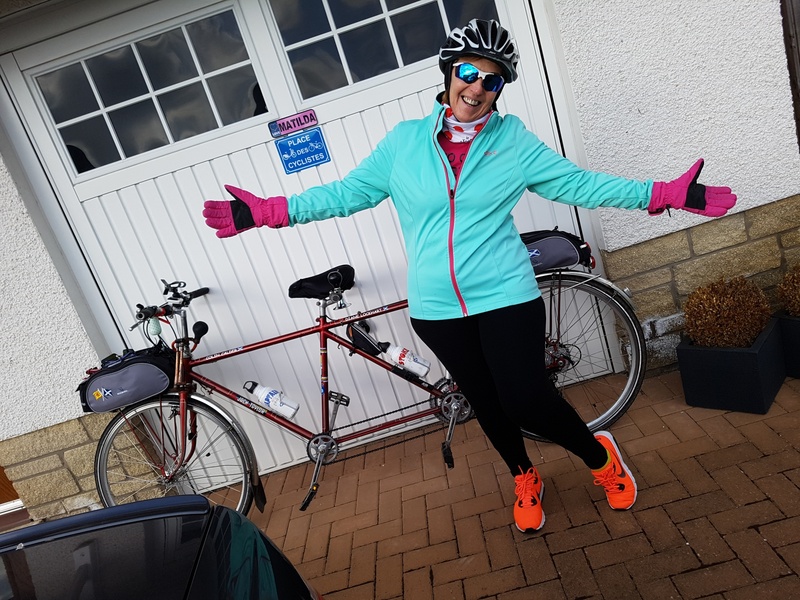 But halfway to Dunblane – just before Kinbuck – rain stopped play with some ninja showers rolling in off the hills forcing the decision to abandon and take shelter before hastily retracing our route back to Braco. It would need to be said my dynamic crew were looking somewhat less than dynamic as they arrived outside the Braco Coffee shop – drookit being the appropriate Scots word! 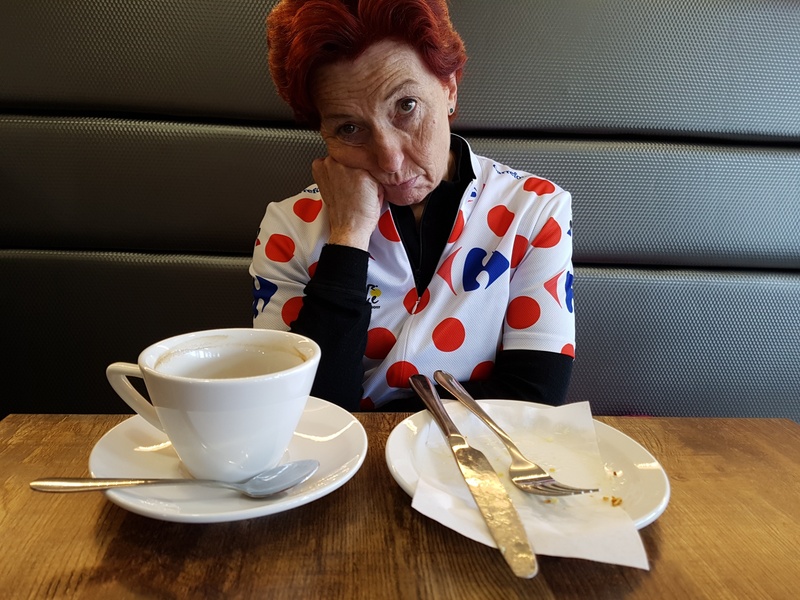 But they were guaranteed a warm and friendly welcome as the previous attempt at sampling the coffee shop ended in inglorious failure as my crew arrived just 8 minutes after the owners had decided to close early at 3 pm for staff training … on a busy Bank Holiday Monday! Braco Coffee was sadly closed on our last visit – but my crew got a friendly welcome this time! It was most definitely a case of “You’ll have had your tea” … as they say in some parts of Scotland as my crew disappointingly arrived that day to find the blinds down and not even the option of buying a carry out coffee, despite having checked the opening hours online before setting out. 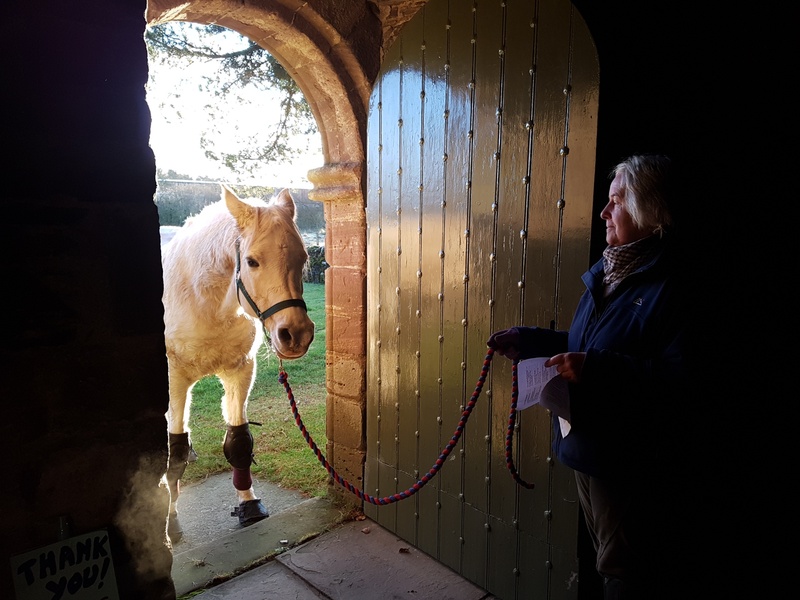 After getting in touch with the owners they admitted it perhaps wasn’t the best day to close early – and tempted my dynamic crew to pay another visit – with some vouchers to help ease the disappointment! Fair play to them, so my Captain and Stoker were happy to re-visit … and well worthwhile it turned out to be. 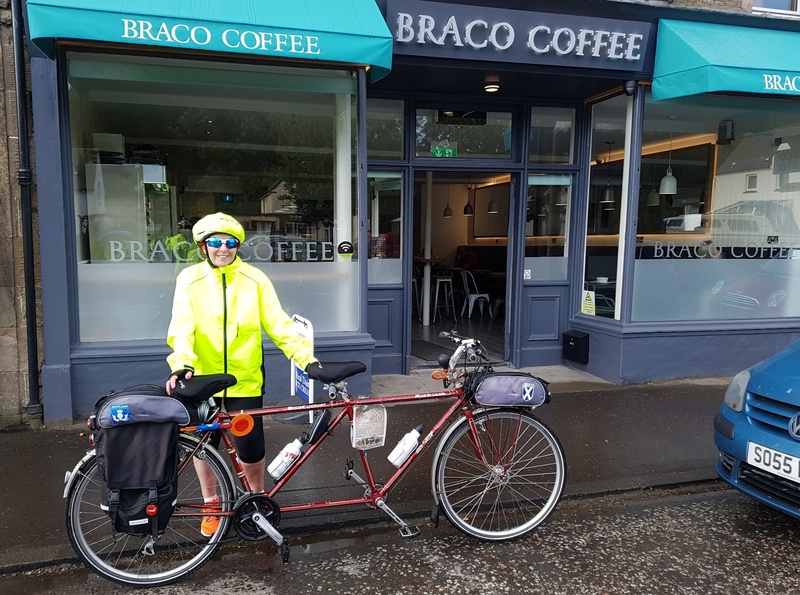 Braco Coffee shop opened its doors back in March and since then has been providing an oasis for cyclists and walkers in the area – well situated on the busy tourist route to Crieff. My dynamic crew can report that the fruit scones, chocolate brownie, and of course the carrot cake were all yummy as was the very welcome freshly brewed strong coffee. The scones were so good that my dynamic crew forgot to take the pictures until after they had been scoffed! The “old git” nearly got his hand bitten off when he remembered and stopped the “old gal” just at the moment of launching in to sample the cakes! The “old gal” still looking a tad wet! But ready to pounce on the cakes! A real plus point for Braco Coffee Shop is that it doesn’t just keep to the coffee and cakes offering – the menu includes interesting freshly made lunch options including the likes of quiche and an interestingly named naanwich … obviously made from naan bread! And you can wash it all down with a glass of wine … or indeed prosecco … as it has a table licence. And it stays open past its usual 5pm closing – till 9pm on a Friday and Saturday, to offer the local area a bistro dining option. 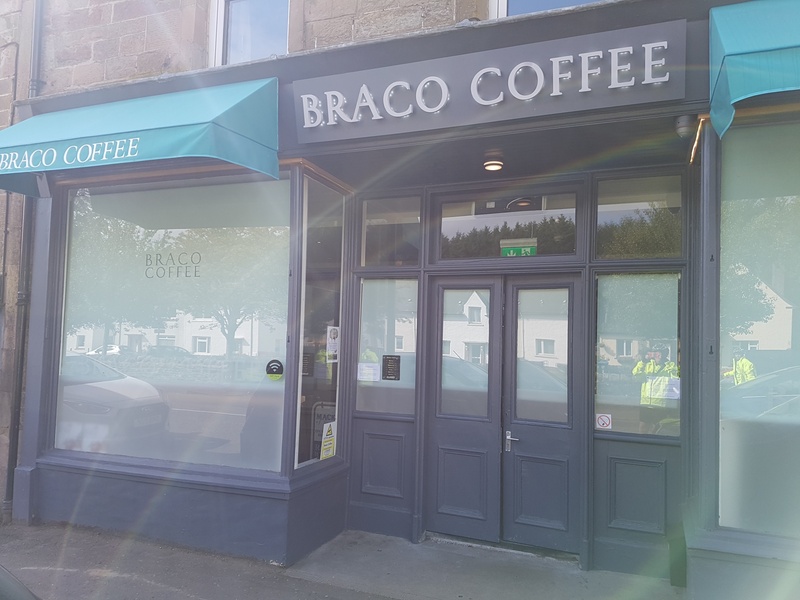 Great friendly customer service with a smile from the Braco Coffee team! 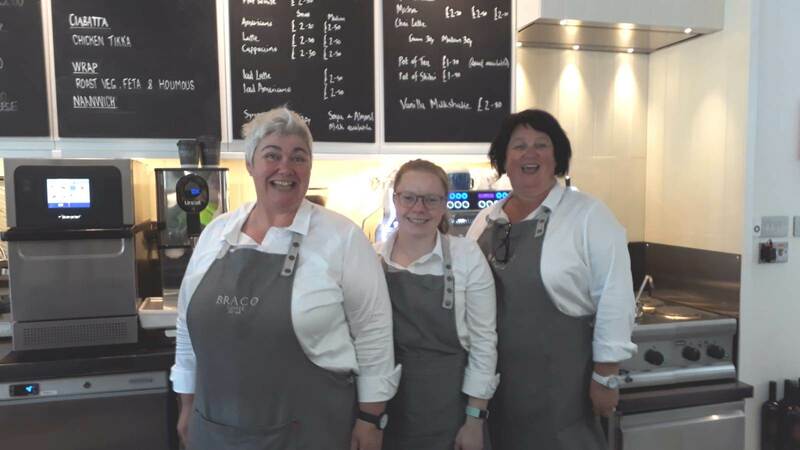 The food was tasty, fresh and well presented – with the scones warm on serving – which along with great friendly service from the Braco Coffee team, and sparkling toilets, meant the venue got top marks from Team Matilda! 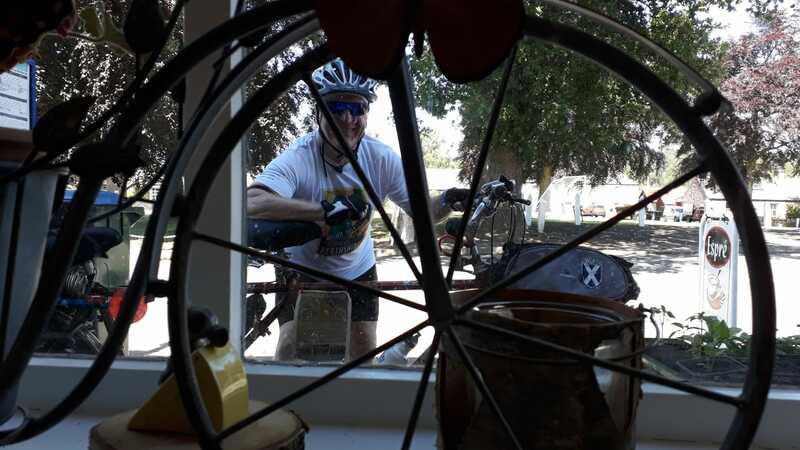 Well worth pointing your wheels in the direction of Braco for a pit stop on your next cycle ride! The carrot cake is worth it alone! 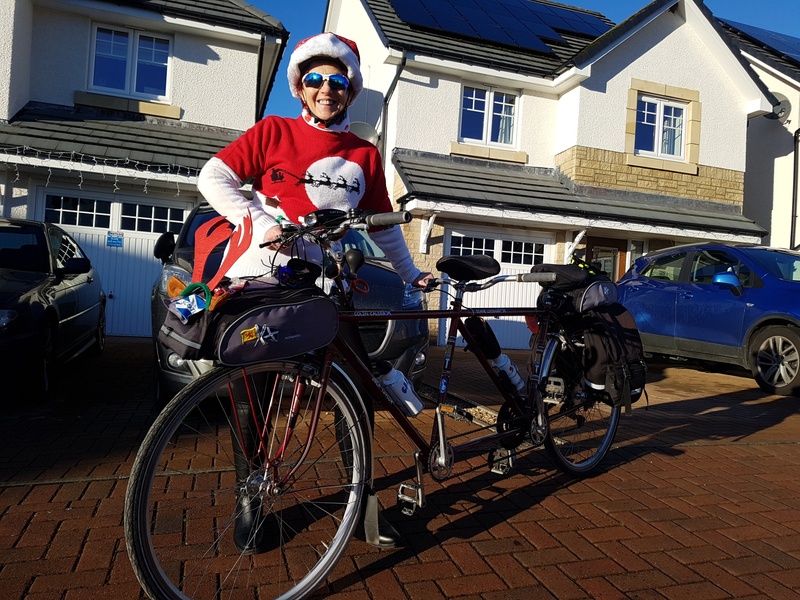 Now fortunately, while my dynamic crew refuelled, the rain disappeared – allowing for a fairly pleasant return tandem ride. 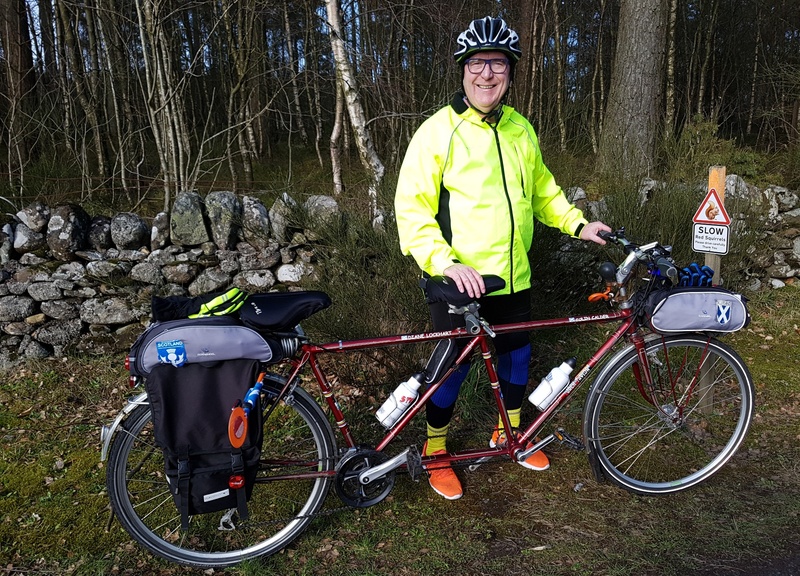 Indeed weather conditions had improved dramatically so the “old git” decided not to simply repeat the outward journey but to add on a few extra miles with a longer loop back via Blackford, Badrill and then past Duchally Country Estate. 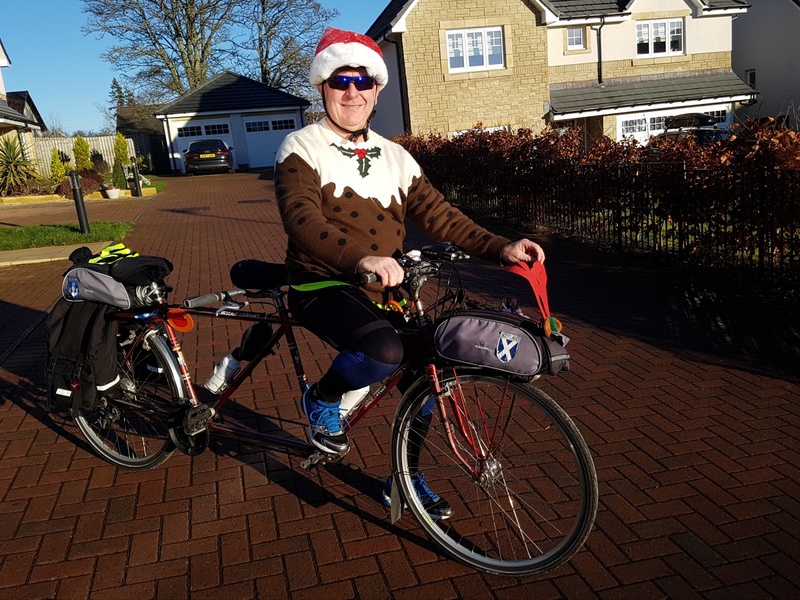 This involved some euphoria after nailing the steep 7% – 10% gradient uphill section known as the Duchally Ramp – which previously had seen my dynamic crew grind to a halt. But in my new low gear they managed to grind it out – which gave all three of us a great sense of achievement. 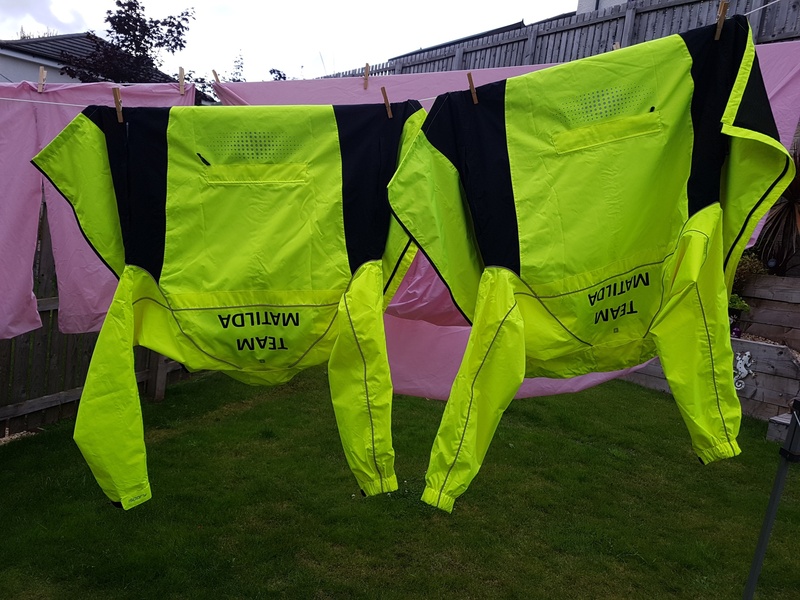 The last three miles flew past and returning to Matildas Rest the “old gal” quickly put the Team Matilda cycling anoraks – which had performed admirably in the downpour – on the washing line to dry. The Team Matilda anoraks that did their job keeping my dynamic crew dry hanging on the line. 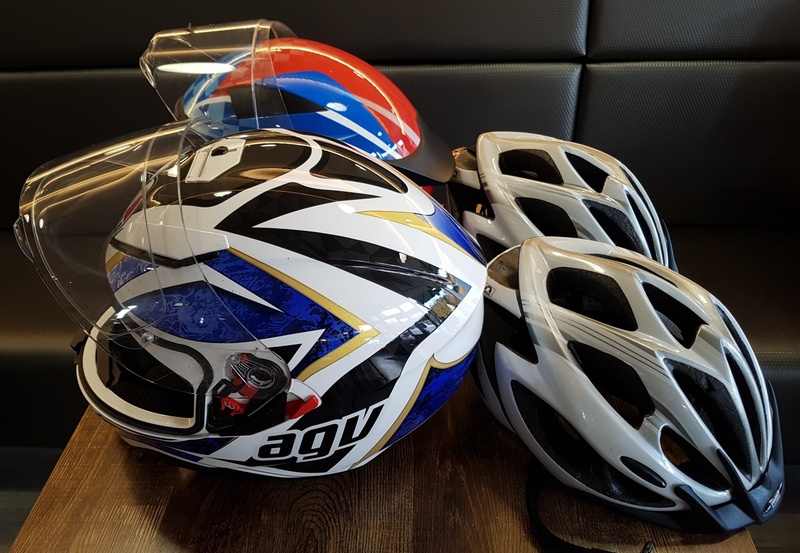 While the anoraks were blowing dry in the wind, the “old git” checked Strava which officially recorded the ride as being worthy of 16 gongs – which given the weather conditions and the hilly terrain was pretty unbelievable! The total was made up of 7 personal bests; and 9 second bests. The detailed Strava figures showed my dynamic crew tandemed a distance of 24.2 miles with a moving time of 2 hours 09 minutes. 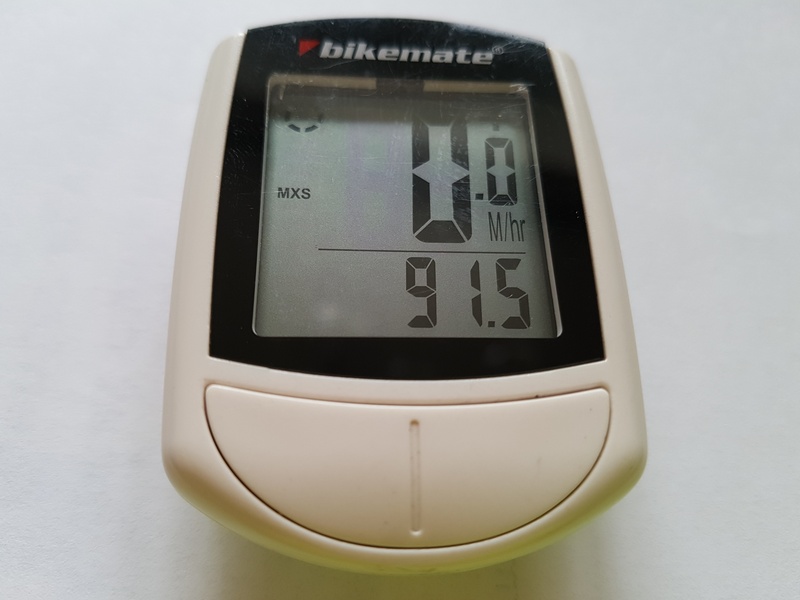 The average speed was a healthy 11.3 mph (given the monsoon rain!) while the elevation was 1401 feet. 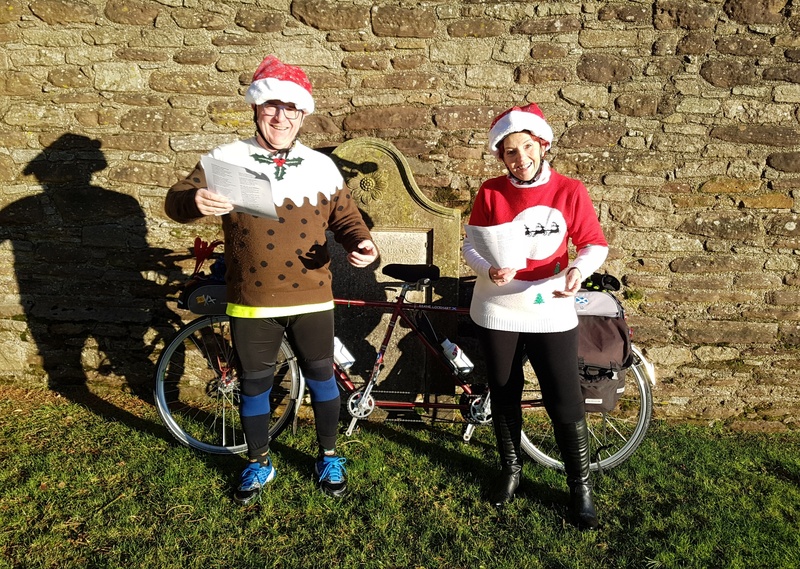 The maximum speed was 33.6 mph and Team Matilda managed to burn up 1569 calories and produce an average power output of 182 W.
So not quite the 35 miles that were planned – but still a good bit of exercise! 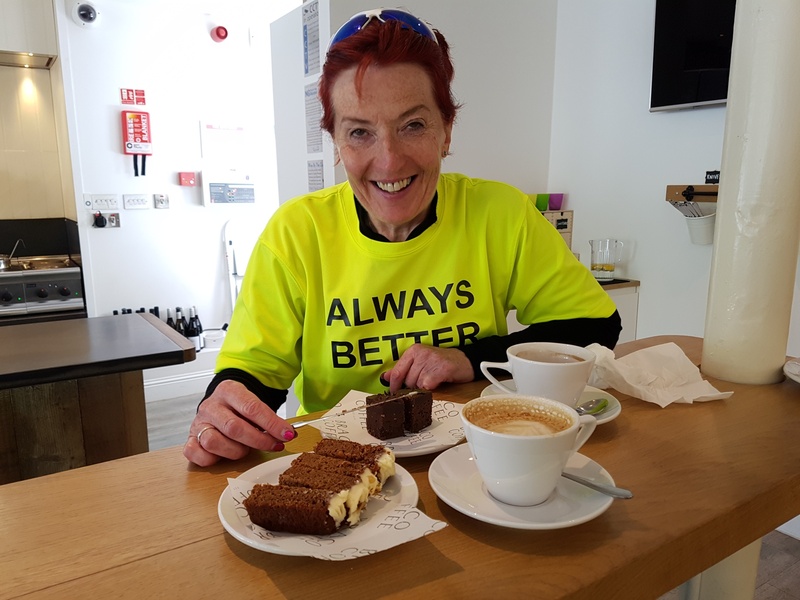 And it is always good to find a another tandem and bike-friendly coffee shop serving carrot cake! We’ll be back! 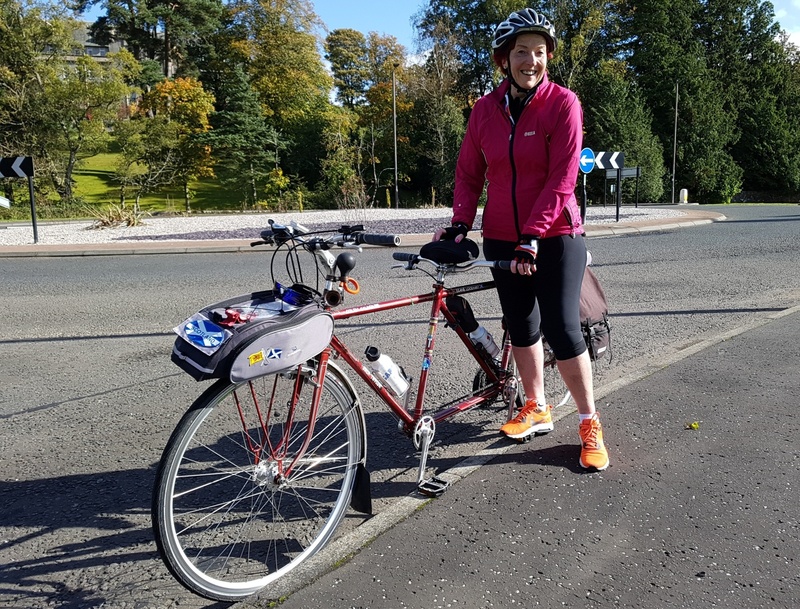 Ready to roll in the warm sunshine – with Dunkeld Bridge in the background. 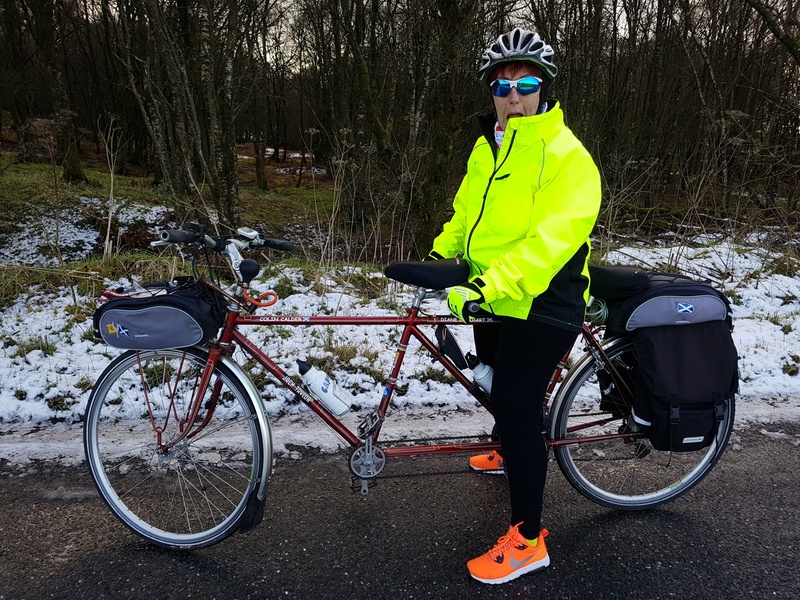 Now as you know this “old lady” likes to try something new every now and again – so when the “old git” came up with the idea of tandeming a new route around the ancient Cathedral “city” of Dunkeld in Highland Perthshire, it seemed like an exciting plan! And when the “old git” mentioned that we passed a couple of coffee shops and finished at a new deli which we also did tapas early evening, the “old gal” was immediately on board too! The addition of the deli word gave the “old git” the joy of coming up with some of his favoured alliteration in the title of the ride – adding to the dens and dells of Dunkeld! Simple pleasures! Now for those who are not au fait with Scots dialect a “den” is a long and narrow valley while a “dell” is a hollow and there are plenty of both in this area … but (whisper it) that also means it is lumpy! 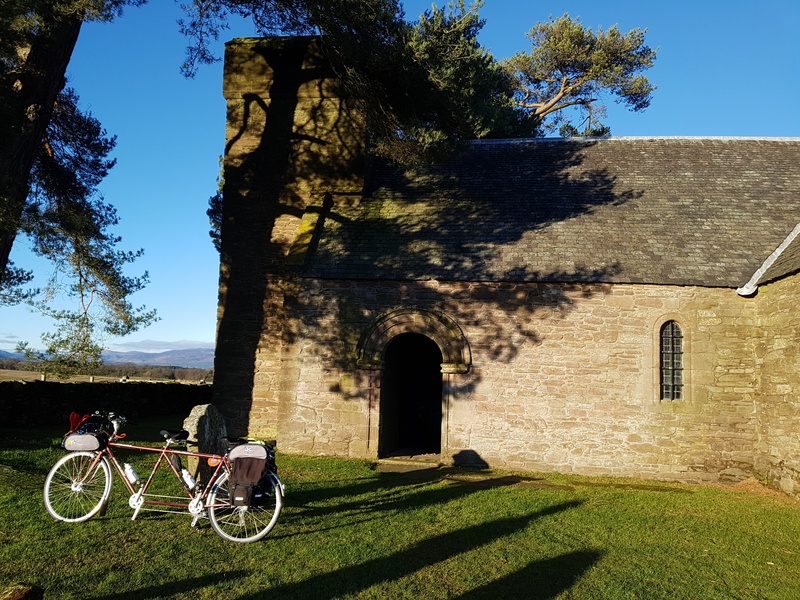 The ride – and some of the recommended stops – recently featured in Scottish Cycling magazine – which is well worth a read. Check out the details of our route by clicking on the Strava map below. 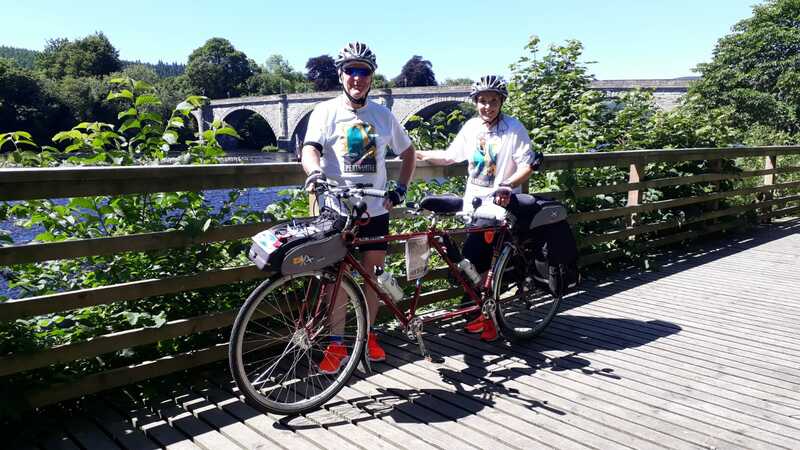 The sun was already high in the sky creating a perfect day for our tandem ride as I was unloaded from Matilda Transport at the Tay Terrace Car Park handily placed beside the river just after crossing Dunkeld Bridge. 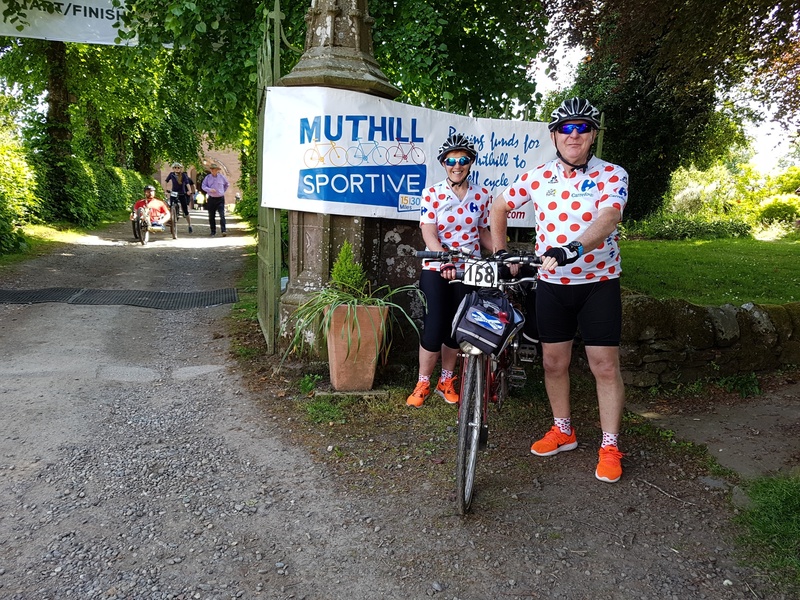 After kitting up – and applying the necessary factor 30 – Team Matilda pedalled off along the A984 which runs east out of Dunkeld to Caputh. This follows the route of an old military road built by Major William Caulfield in the 18th century. 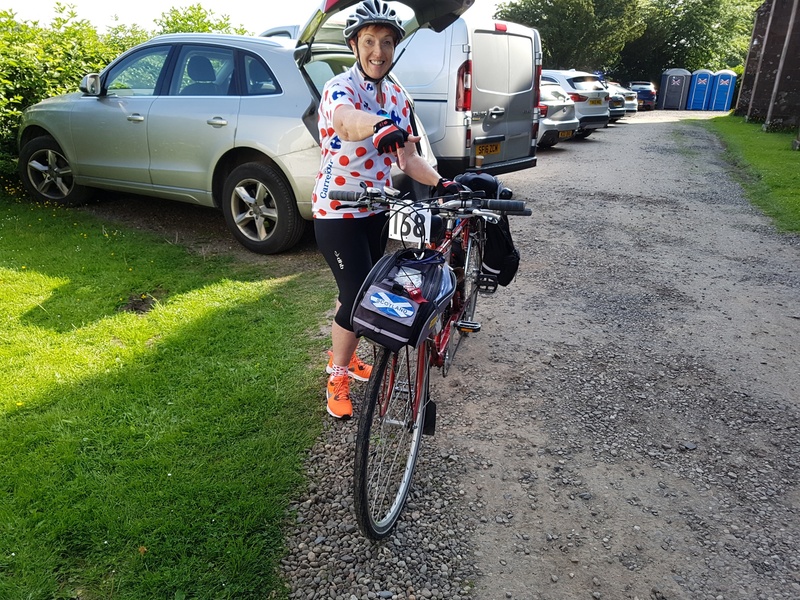 It is a lovely road to cycle with mild undulations and and some great views over the majestic River Tay. Just after Caputh is the hamlet of Spittalfield which is home to the cyclist and walker-friendly Walkin’ Cafe. Opened a year ago the welcoming cafe specifically targets cyclists and walkers who frequent the area. For many years the building was the village store before being transformed into a cafe to keep it as a hub of the village. The cafe has lots of cycling-related aftefacts to catch the eye – and don’t forget to look out for the French-designed poster showing all the different kinds of bikes which have been produced over the years … in the toilets! Glad to say that a tandem was featured among the drawings! The “old git” and “old gal” quickly polished off a coffee and scone from the appealing treats on offer. The Walkin’ Cafe is a real oasis for cyclists and has lots of bike artefacts. 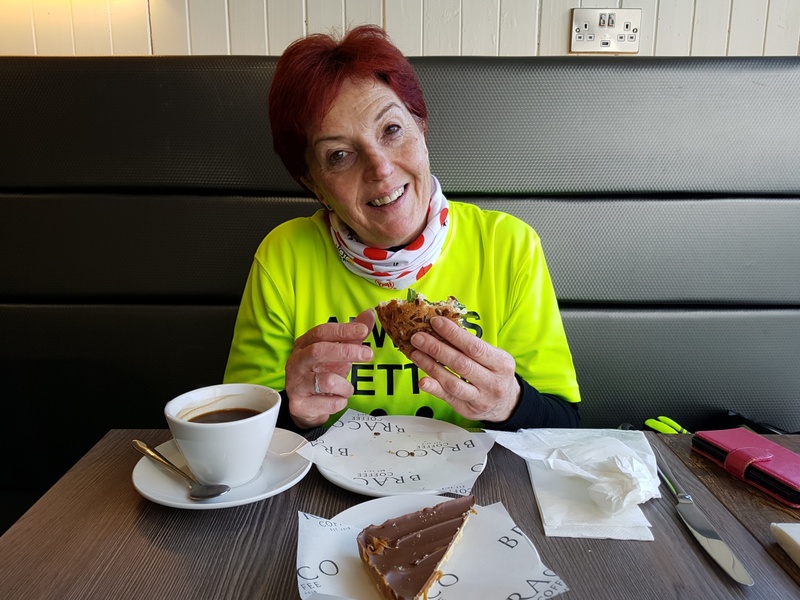 The Walkin’ Cafe is ideally situated on the A984 at Spittalfield to attract cyclists and walkers. 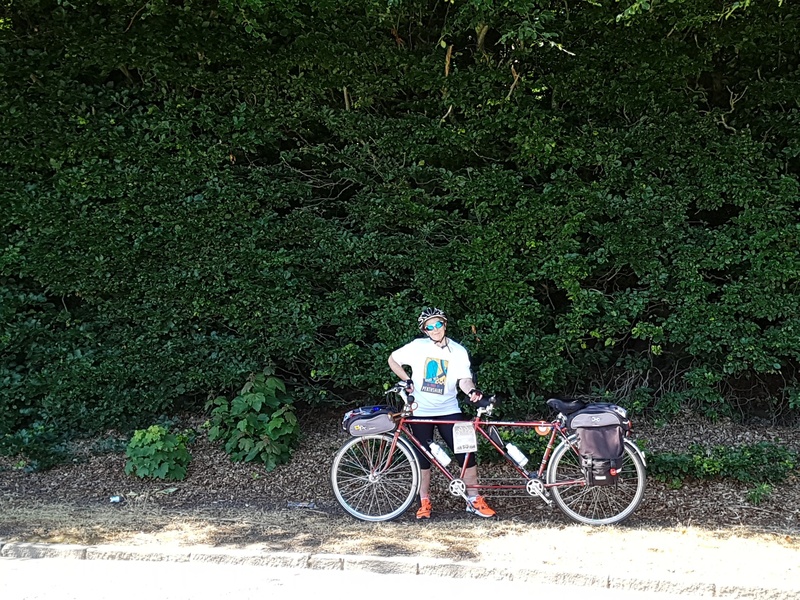 Refreshed we pedalled on for around four miles to a local landmark of the Meikleour Beech Hedge which is recognised by the Guinness Book of Records as being the longest hedge in Britain and the highest of its kind in the world. It is is one third of a mile long (530 m) and 100 ft (30 m) high. It is thought the men who planted it in 1745 were called to fight in the Jacobite Rebellion and sadly none of them returned alive. In tribute the trees were allowed to grow and the hedge acts as a living landmark to them. The “old gal” dwarfed by the Meikleour Beech Hedge – the longest hedge in the UK. 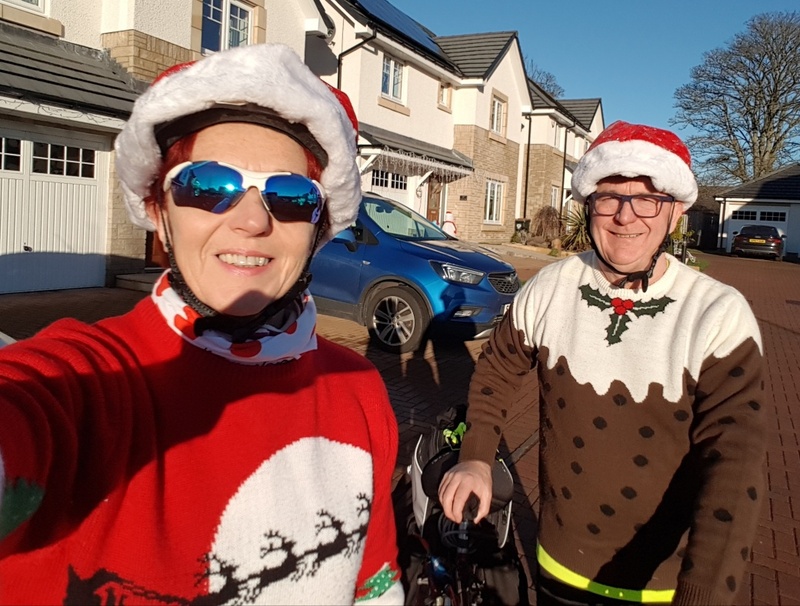 Our route took us left at Meikleour on to the A93 towards Blairgowrie – and although it was quite a busy road cars gave us plenty of space as we pedalled along. 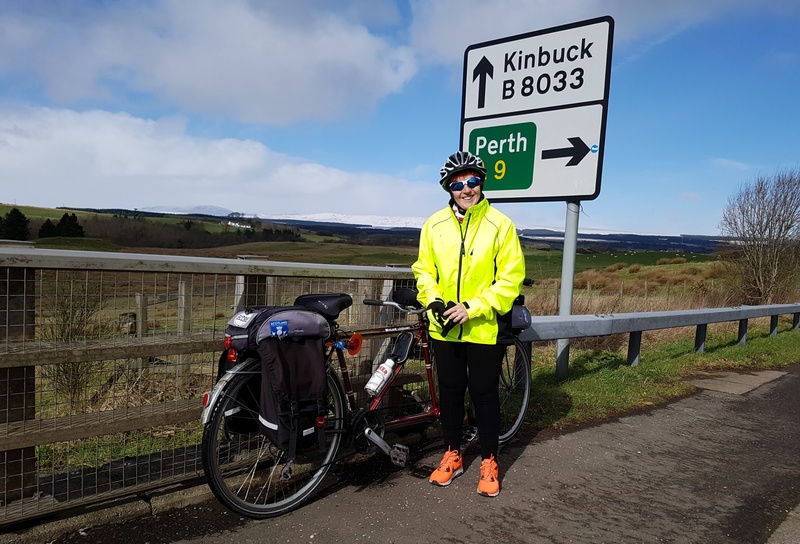 Just before Blairgowrie centre, we turned left again on to the scenic A923 which would take us back to Dunkeld – with the promise of enjoying the views over no less than six lochs along the way. 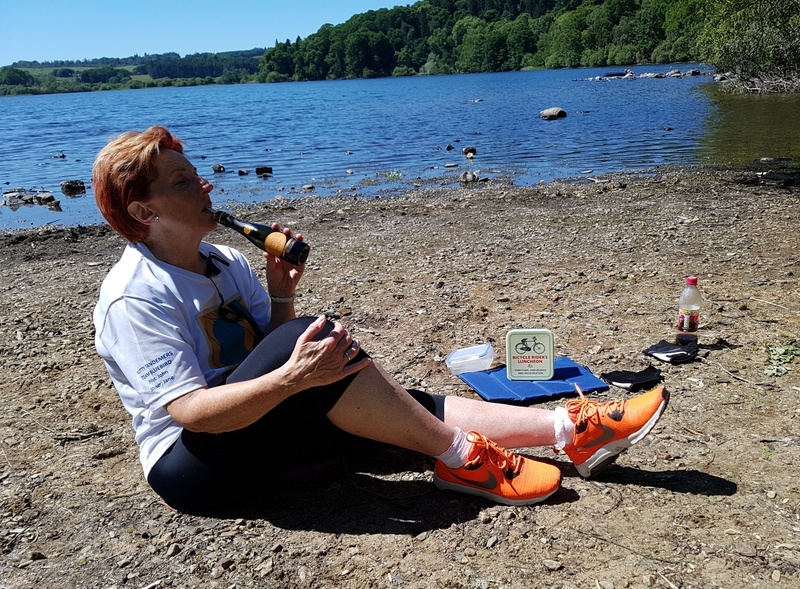 We quickly passed Rae Loch and Loch of Drumellie before the “old gal” decided it was time to stop for one of Team Matilda’s infamous prosecco picnics! She fortuitously called stop at beautiful Loch of Clunie. Although it was busy – due to the sunshine – with families enjoying the shallow calm water she found a spot on the beach to allow my dynamic crew to sunbathe and enjoy their picnic goodies. 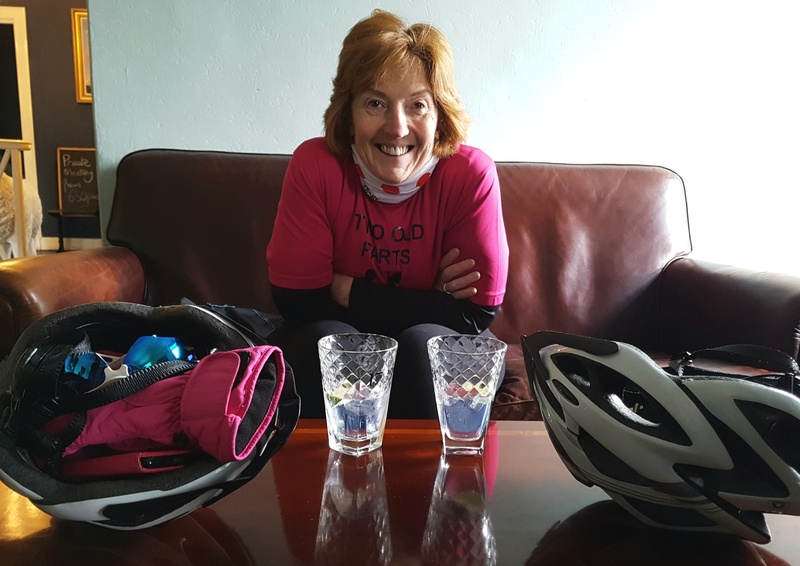 And the sit was made all the more comfortable by our fab new fold-up pads which our good cycling friends John and Jane had given my crew on the recent mini Tour de Perthshire. Sun-kissed Loch of Clunie provided the perfect stop for a prosecco picnic. Selfie time for my dynamic crew enjoying the warm sun on the loch’s beach. Chillin – the “old gal” relaxing in the sun on our new picnic pads. Back on the road and maybe it was just the effects of the relaxing picnic, but my dynamic crew noticed the gentle incline as we headed on past Loch of Butterstone. 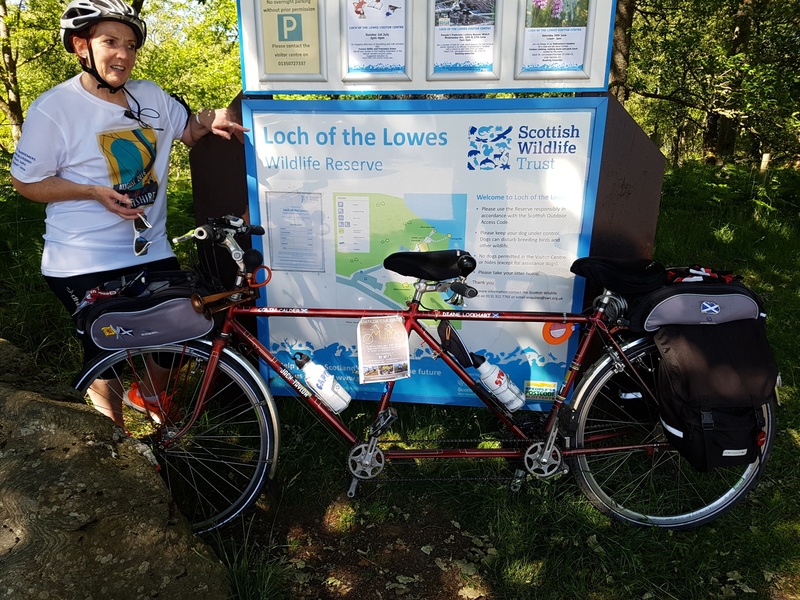 We took a short diversion to the entrance to the Scottish Wildlife Trust Loch of the Lowes wildlife reserve – a near 100 hectacre site where the star attraction is a pair of breeding ospreys which nest just 150 metres from the observation hide. We had actually spotted the huge wingspan of one of the magnificent birds doing a spot of fishing for food for their chicks in one of the lochs earlier. The Loch of the Lowes reserve – famous for its ospreys – is run by the Scottish Wildlife Trust. 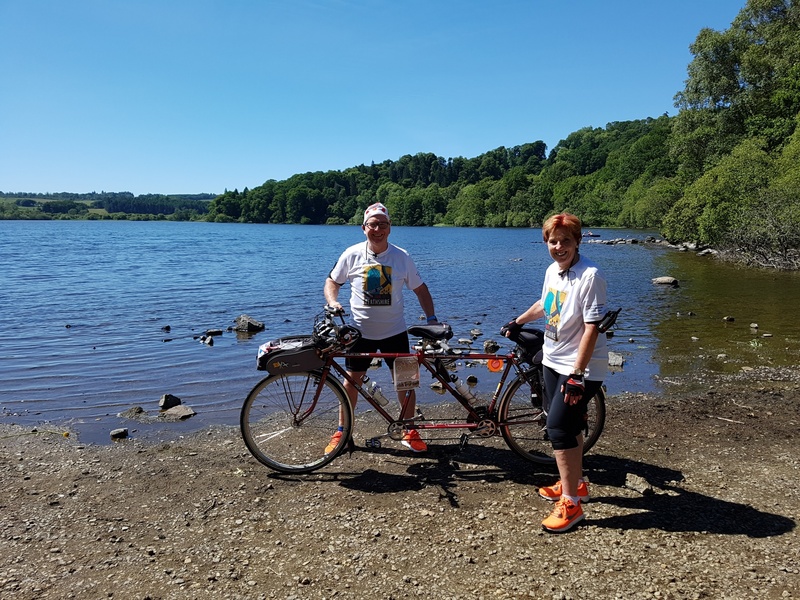 From the last of the six lochs – Loch of Craiglush – there is a steep climb and my dynamic crew had to work hard to keep my wheels turning. A long winding – but welcome – swooping downhill stretch returned us to Dunkeld with some time to explore the town. First stop was the eye-catching Atholl Memorial Fountain in the Market Cross area. 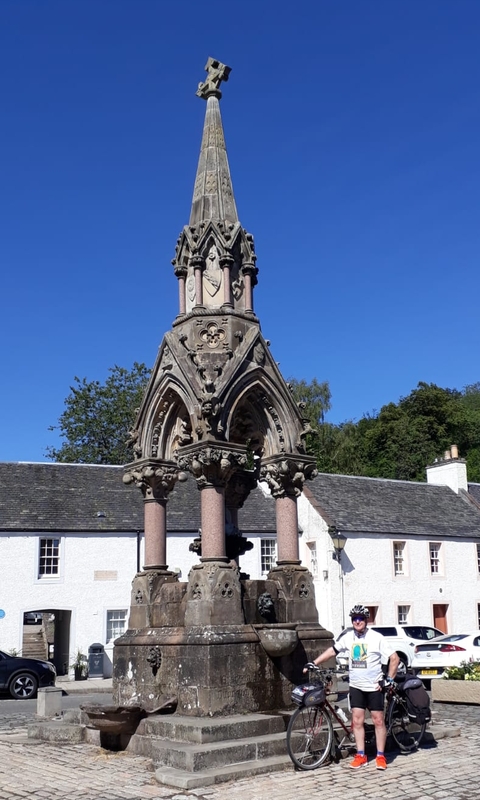 The Fountain was funded by public subscription and built in 1866 ‘to the memory of George Augustus Frederick John 6th Duke of Atholl’ who had introduced a piped water supply to Dunkeld. The “old git” at the Atholl Memorial Fountain in Dunkeld. 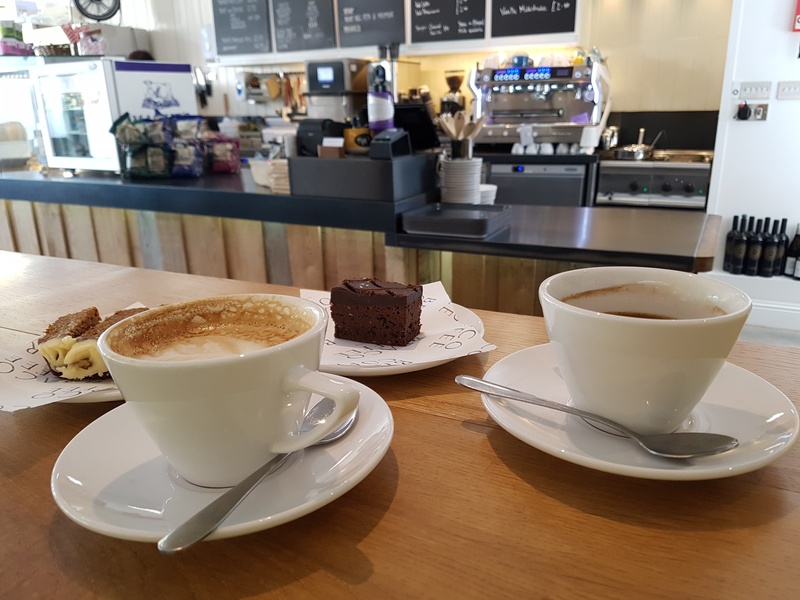 By now my dynamic crew were ready for a re-fuel and had some fabulous cake sitting outside on the sun drenched terrace at the Spill the Beans coffee shop. 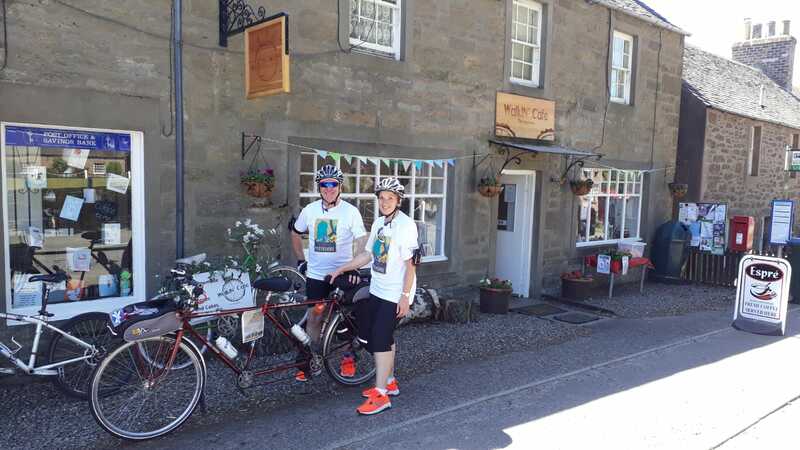 Next we took in some of the Dunkeld Heritage Walk (or cycle!) which takes in many of the restored 18th century merchants houses in Cathedral Street – which are now looked after by The Little Houses Improvement Scheme – in partnership with the National Trust for Scotland. This includes The Old Rectory which is Dunkeld’s oldest surviving house. Scotland’s National Bard Robert Burns and Fiddler Neil Gow entertained here in 1787. I feel like a young thing beside Dunkeld’s oldest surviving house! Cathedral Street – not surprisingly – leads to Dunkeld Cathedral whose history can be traced to the ninth century when it emerged as an important religious centre for the early Celtic Church. No building of this period survives, the present Cathedral dates from 1318. Partly destroyed during the Reformation (1560), the choir is roofed and now serves as the parish church for regular Sunday worship. The rest of the cathedral is ruinous, but is preserved as an Ancient Monument in the care of Historic Environment Scotland, who are also responsible for the grounds. 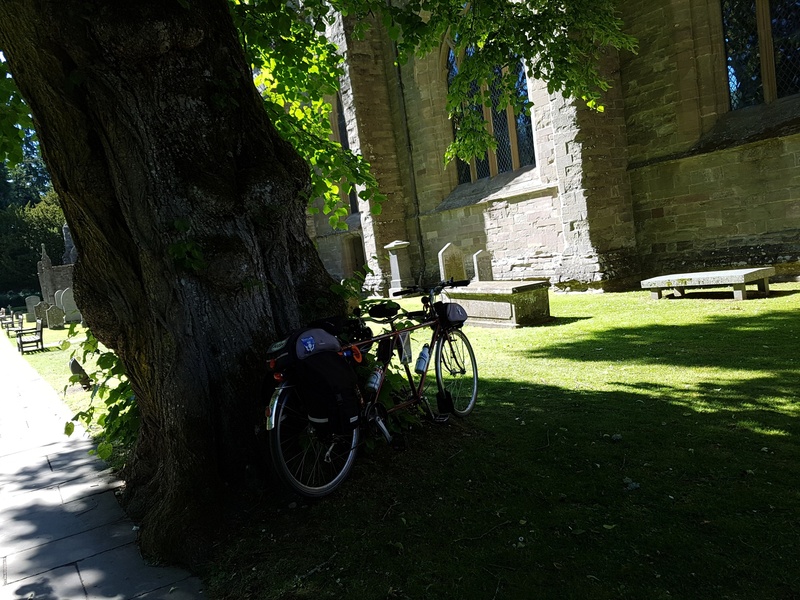 Cooling in the shade in the grounds of the historic Dunkeld Cathedral. The cathedral’s grounds give great views over the River Tay and Dunkeld Bridge. 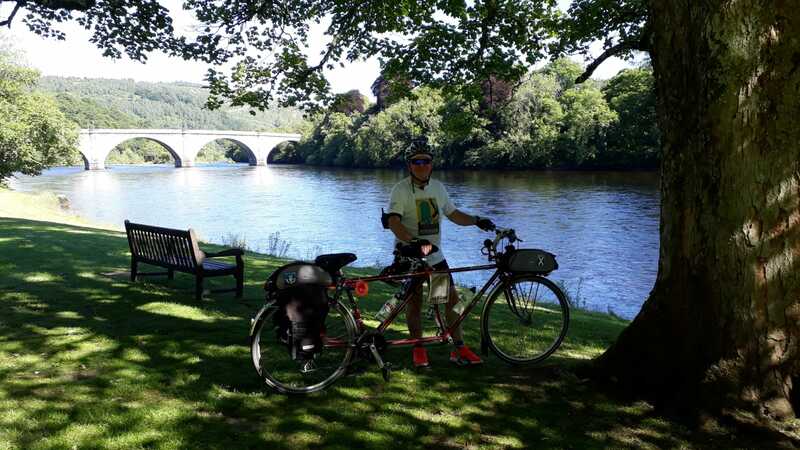 The grounds of the cathedral give great views over the majestic River Tay and the historic Dunkeld Bridge which was built by Thomas Telford and opened in 1809. After all the miles and the local history it was time for us all to return to Matilda Transport. I was safely loaded back inside while my dynamic crew got changed for a refreshment stop before dinner. 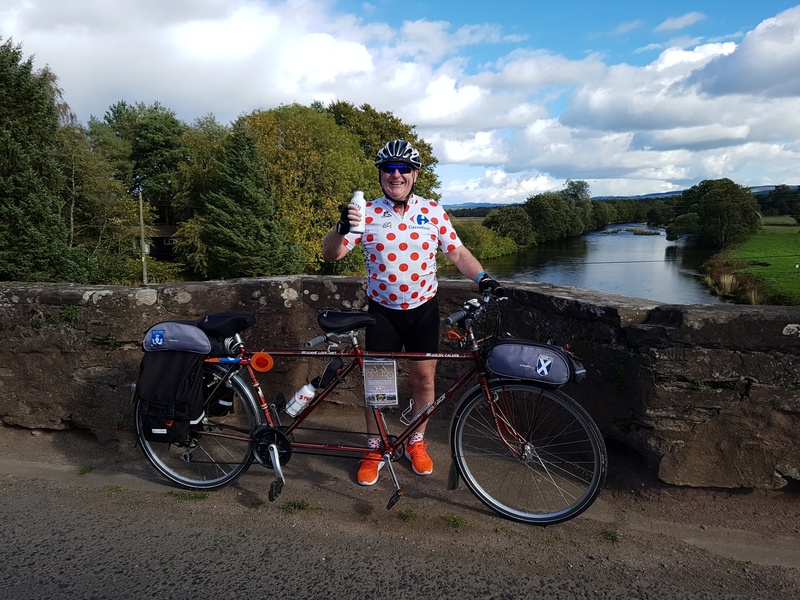 Over a nicely chilled glass of white wine, and enjoying the warm sunshine on the decking of the Atholl Arms overlooking the river, the “old git” checked Strava which showed no gongs as this was our first time on this route. But the detailed Strava figures showed my dynamic crew tandemed a distance of 26 miles with a moving time of 2 hours 03 minutes. The average speed was a healthy 12.7 mph given a couple of sharp hills while the elevation was 1178 feet. The maximum speed was 29.5 mph and Team Matilda managed to burn up 1528 calories and produce an average power output of 185 W.
Suitably impressed by that data my dynamic crew ended their day out in style with a mouth watering tapas meal at the highly recommended The Scottish Deli on Dunkeld’s Atholl Street. I am told that the prawns in garlic and the manchego cheese and serrano ham platter were particularly impressive! Replete it was time for the 30 minute return drive to Matildas Rest and soon time for some zzzs after a memorable sunny day out as we tandemed the dens, dells and delis of Dunkeld in glorious Perthshire! The new stone in Forteviot is inspired by the strong Pictish culture and the Dupplin Cross. My dynamic crew decided they could wait no longer for the temperature to start rising. 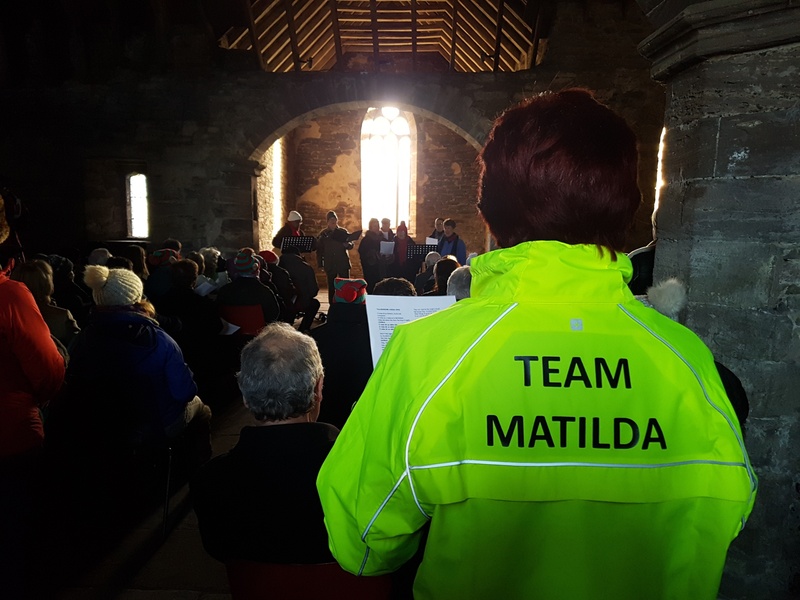 And much as the “old gal” likes some warmth, there was a resounding acceptance that Team Matilda had to emerge from their winter hibernation before rust and inactivity seized up all our joints! 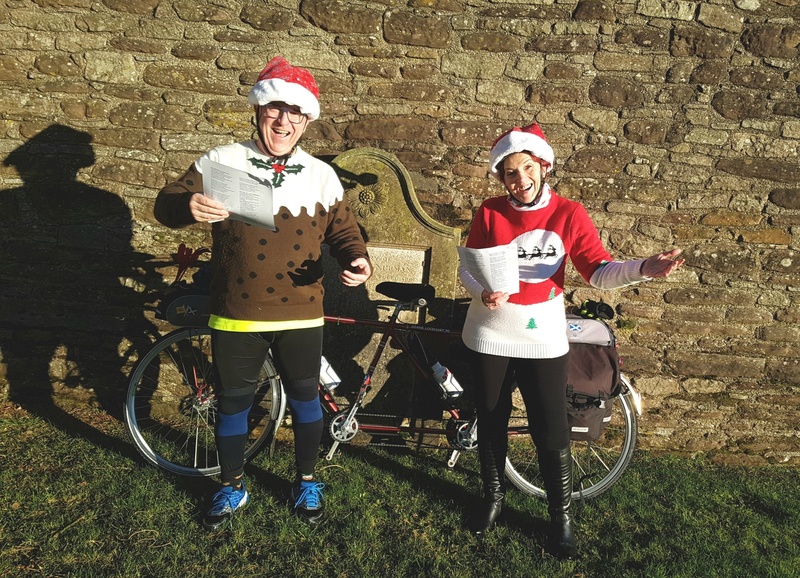 Our last outing was just over two months ago – back before Christmas, with a short ride to Carols at Tullibardine Chapel. So, with the weather forecast giving dire warnings of the Beast from the East blasting freezing temperatures and lots of snow at the start of the week, the “old git” decided it was a case of now or never! Ready to roll for 2018! Emerging from my garage at Matildas Rest! My crew wakened to bright sunshine but the temperature was still stuck on zero as they fuelled up with a hearty but healthy breakfast. 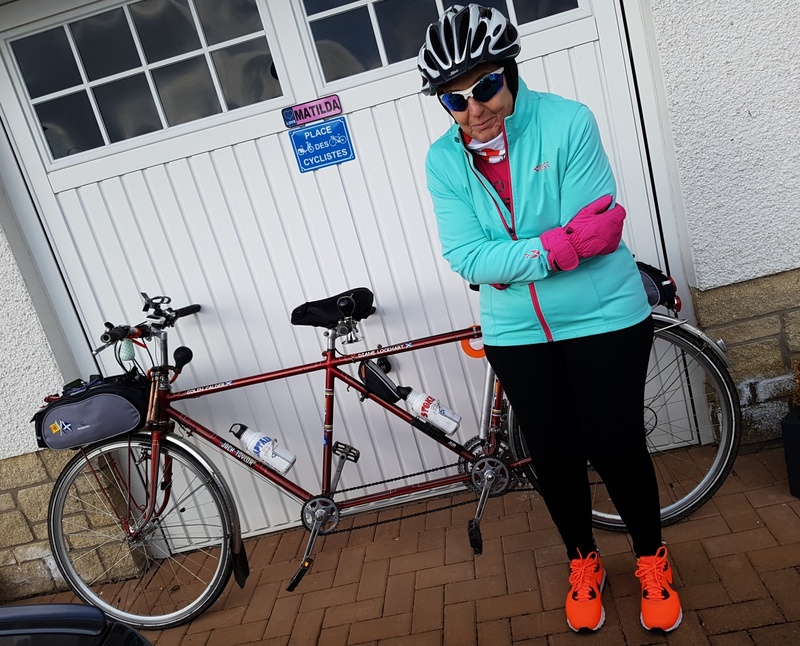 Next task was getting kitted up in multiple layers of winter cycling gear before I finally emerged out of my comfy garage at Matildas Rest for the first time in 2018. After the “old gal” in her role as “chief mechanic” gave me the once over to check all my bits were lubricated and in working order, we headed off. The “old gal” – half of my dynamic crew – wrapped up against the elements! 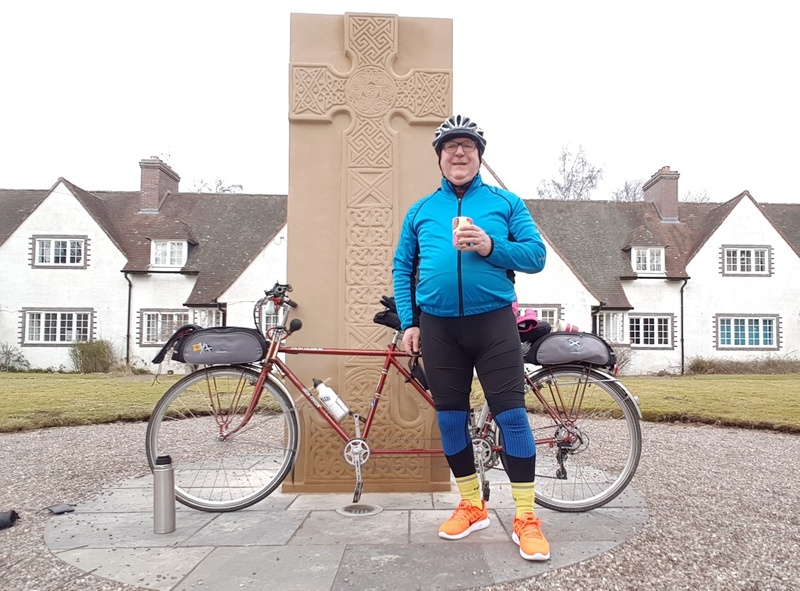 The “old git” had chosen a run that would be a pedal around Pictish Perthshire – heading towards the historic nearby villages of Dunning and then on to Forteviot, covering a distance of just under 16 miles with a few hills thrown in to test their fitness after a long lay off. With the sun on our faces my dynamic crew tentatively pedalled off into the glorious Perthshire countryside towards Dunning. Despite initially feeling like tandem novices all three of us were quickly back into the way of it. 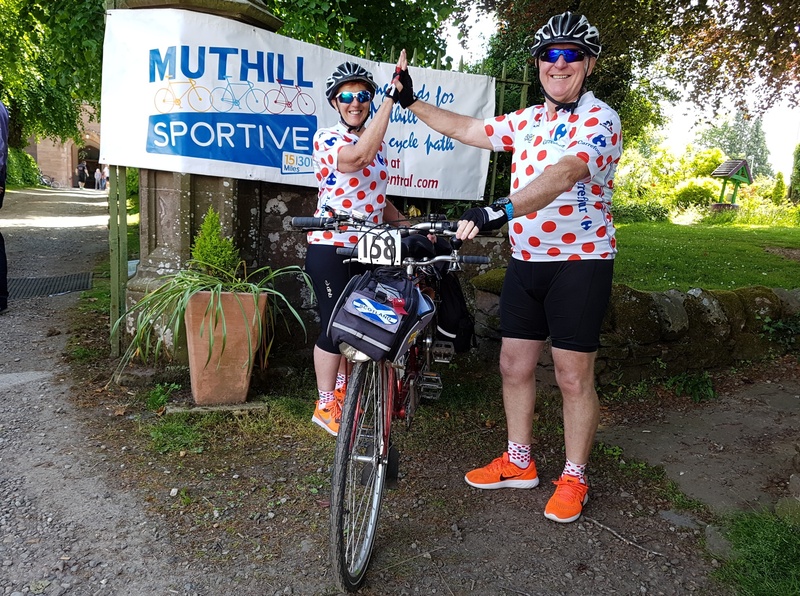 It probably helped that the first stretch involves a steep downhill which saw us record a speed of just over 25 mph within the first three minutes of leaving Matildas Rest! Let’s just say that speed wasn’t beaten for the rest of the ride. But the synchronicity factor of the “old git” and the “old gal” soon kicked in and we quickly picked up some speed, with all three of us perfectly in tune! 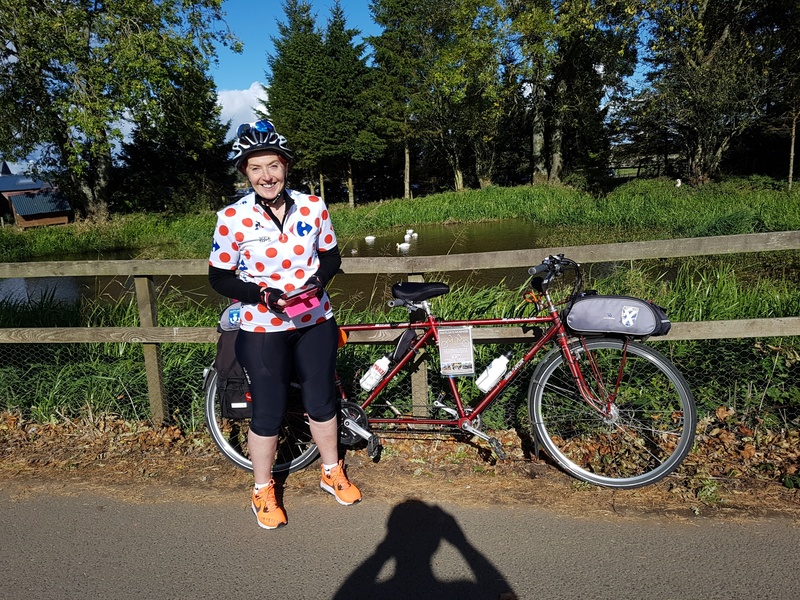 It was great to be back out and feel the fresh air between my spokes on the quiet country roads of Perthshire – which are great for tandeming and cycling, as shown by the number of bikes we saw while out on our ride. “This is the kind of tandeming I like” exclaimed the “old gal” as my crew pedalled along feeling very pleased with themselves. 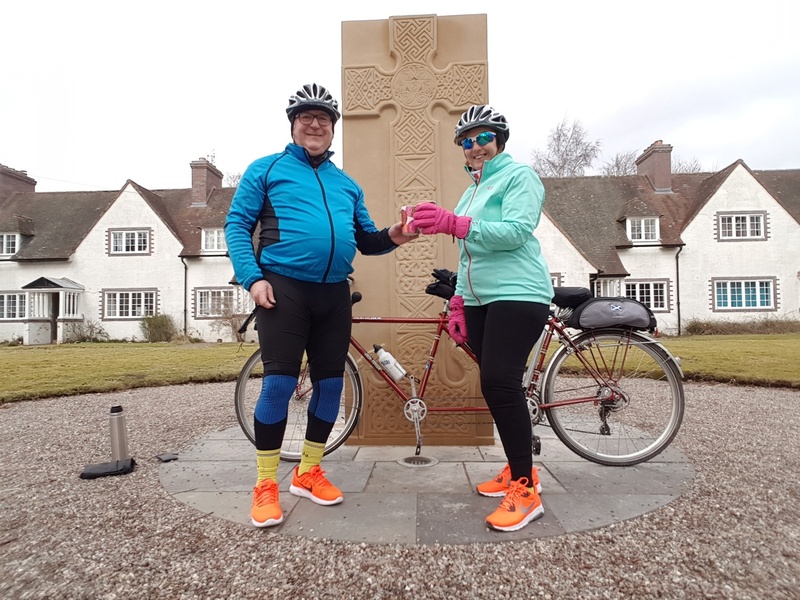 In what seemed like no time at all we tandemed into Forteviot – an ancient Pictish capital of Scotland, where King Kenneth MacAlpin died in the 9th Century. We had travelled the near 8 miles in 50 minutes – which wasn’t too bad considering it was our first ride of the year – and the village was looking its usual pretty self in the sunshine. The village “square” (or green to be exact!) has some very quaint houses which were rebuilt for workers of the Dupplin Estate in 1927 and are create a lovely focal point for the village. Time for a welcome cup of hot coffee for my dynamic crew at the new Forteviot stone. As my crew enjoyed a cup of hot coffee – which the “old gal” had thoughtfully added to a flask before departure – they discovered a fabulous new centrepiece to the village since Team Matildas last visit. A new carved stone now stands proudly – inspired by the strong Pictish culture and the historic Dupplin Cross. The original rare 3m high cross, carved out of sandstone in around AD800, once stood in the palace of the Pictish Kings at Forteviot. 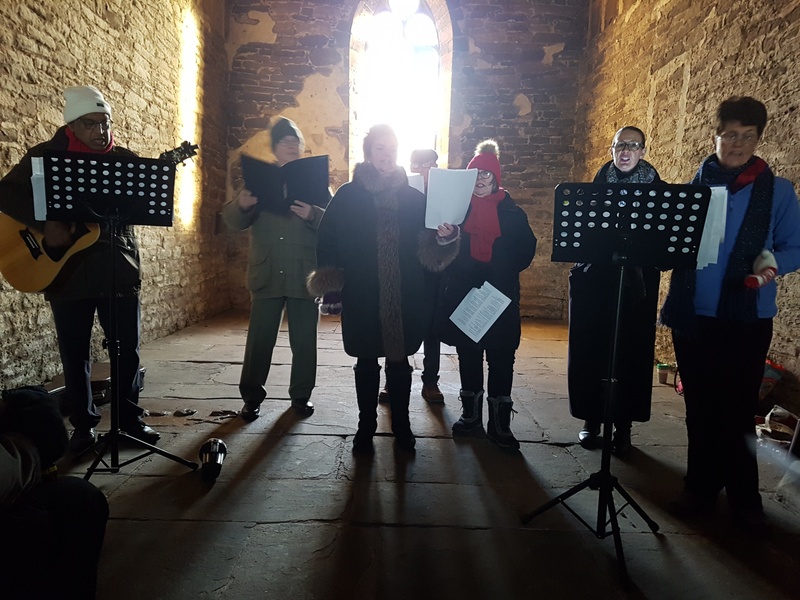 It is now housed in the nearby St Serf’s Church in Dunning and looked after by Historic Environment Scotland. There is no plaque in place as yet to tell you about it, but a chat with some locals saw my dynamic crew discover it is called Set in Stone – the Birth of Alba and is a new Pictish stone celebrating Forteviot’s important role in the birth of medieval Scotland. The new stone carving – which is sensitively floodlit at night – is part of the Heritage Lottery funded Pictish Stones project run by the Tay Landscape Partnership to provide the area with a key legacy monument marking the kingdom that became Scotland. The new contemporary Pictish sculpture is being formally unveiled on Saturday 17 March at 12 noon. The “old git” in his not remotely colour coordinated winter kit! But he wasn’t cold! While enjoying the warmth of the coffee the “old gal” noticed that the old green wooden bus shelter was being rebuilt – and went over to speak to the workman who was cutting and sawing wood. This turned out to be local forester Jim Thomson who runs his own Woodland Craft business. 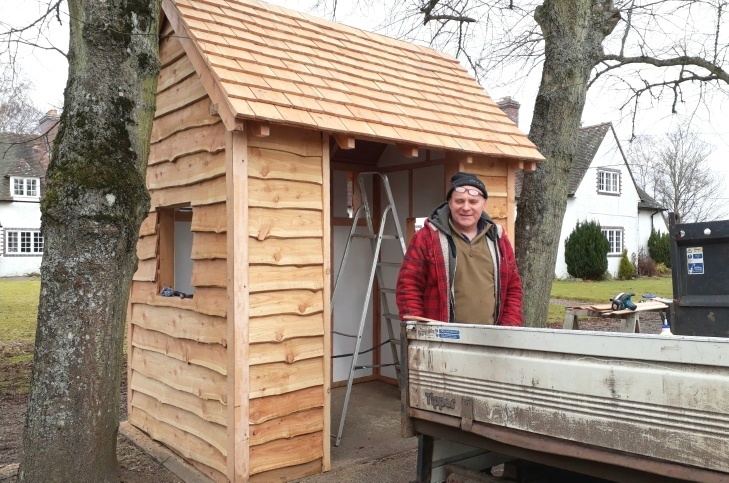 Forester Jim Thomson is building a new bus shelter as part of the Tay Landscape Partnership project. Jim has been contracted to build a new eco-friendly bus shelter in Forteviot as part of the Tay Landscape Partnership funding for the area. It was certainly one of the best built bus shelters my crew had seen! 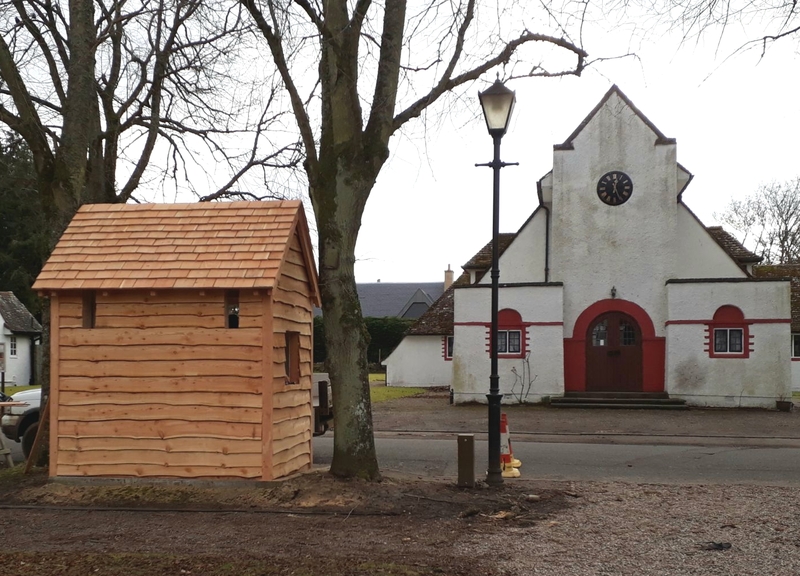 The new environmentally friendly wooden bus shelter taking shape in Forteviot. 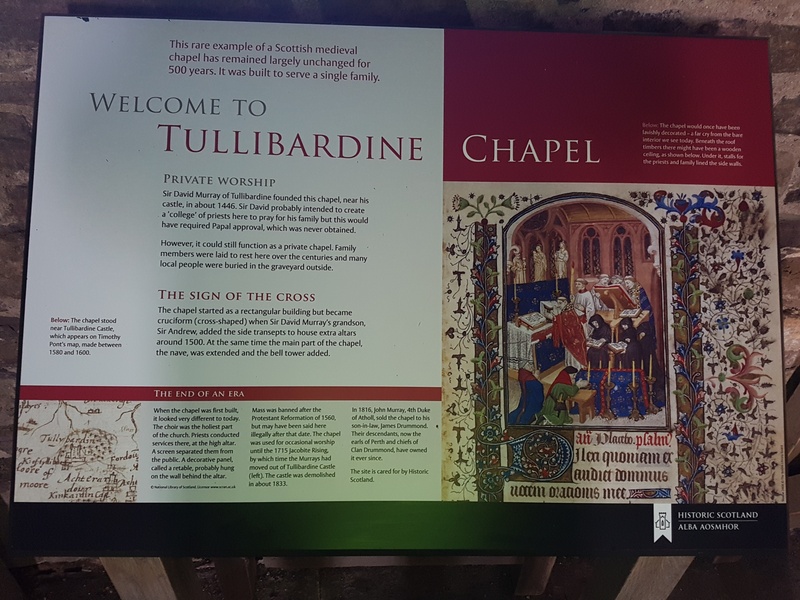 It was great to see such activity in the village – which will hopefully provide a flow of visitors keen to find out more about the Pictish history of the area. 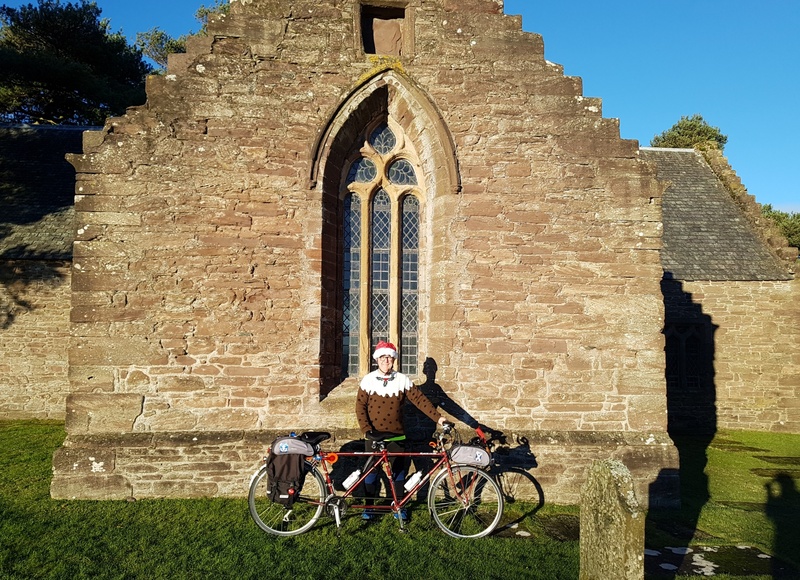 Bidding farewell to Jim, and before we got too cold, we headed back on our return journey – passing another historical site worth visiting in the village – Forteviot Church of St Andrew where archaeological studies indicate that Christians were first buried in the graveyard in the 6th century. 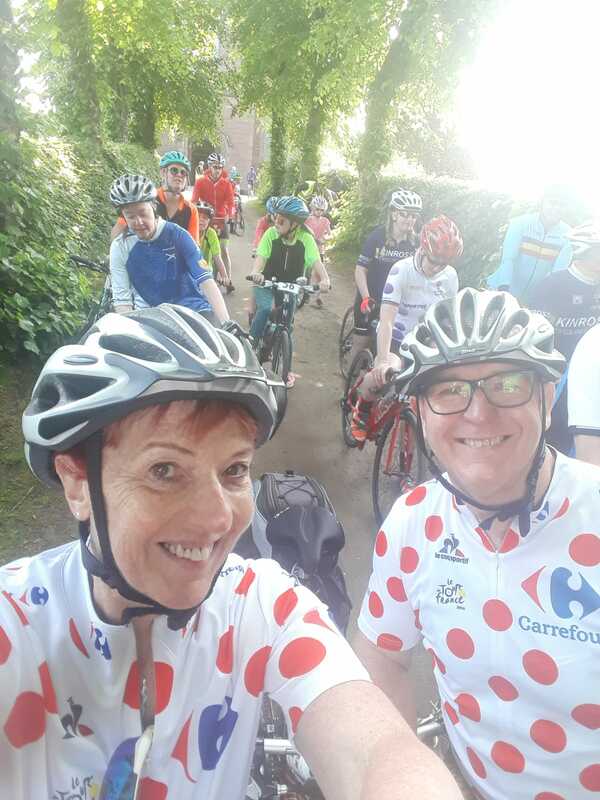 My dynamic crew pedalled furiously to create some heat – and were in buoyant mood as they discovered that there was (for once!) no headwind to battle. Despite a few hills climbing out of Forteviot we were soon tandeming into Dunning – a village which is also rich in history having been burned to the ground during the 1715 Jacobite Rebellion. 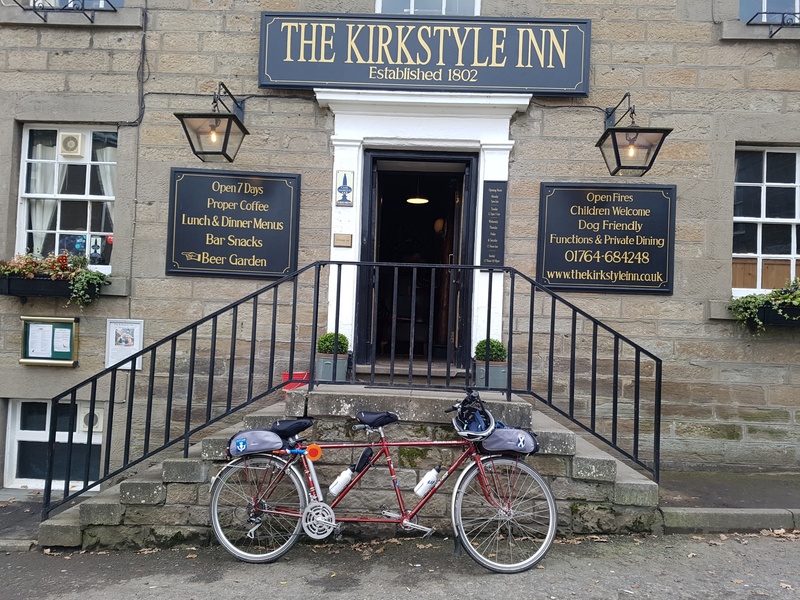 Here I am parked up outside the Kirkstyle Inn in Dunning – need a loo stop they said! It is also boasts a great friendly country pub called The Kirkstyle Inn which my dynamic crew have been known to visit from time to time! 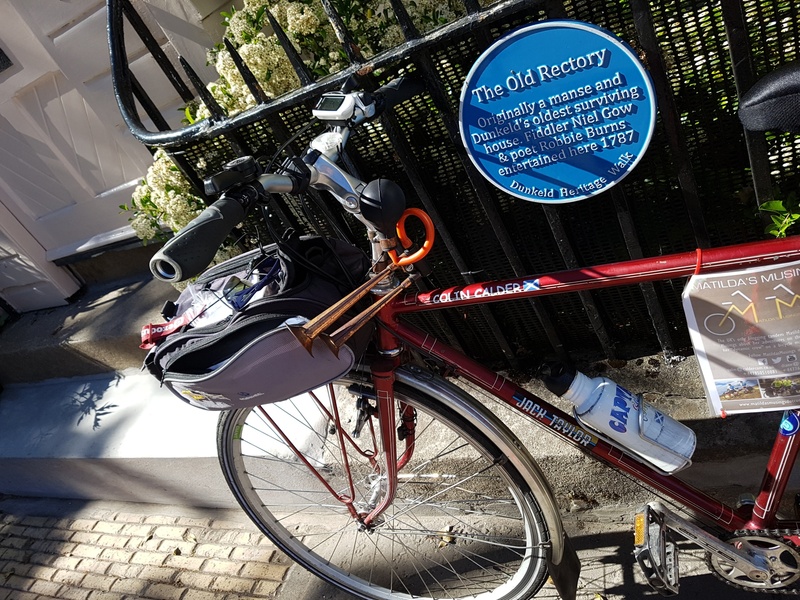 It provided the ideal place for a loo stop – which the “old gal” then decided would be a good spot for a small libation to fuel up for the final miles home! After all it would have been rude not to! The “old gal” decided a small libation would help the ride home! So after a lovely Scottish artisan gin, it was time for the last four miles home. Gosh it had suddenly turned a good bit colder – wonder if that was anything to do with the cosy pub and the gin!? Surely not! 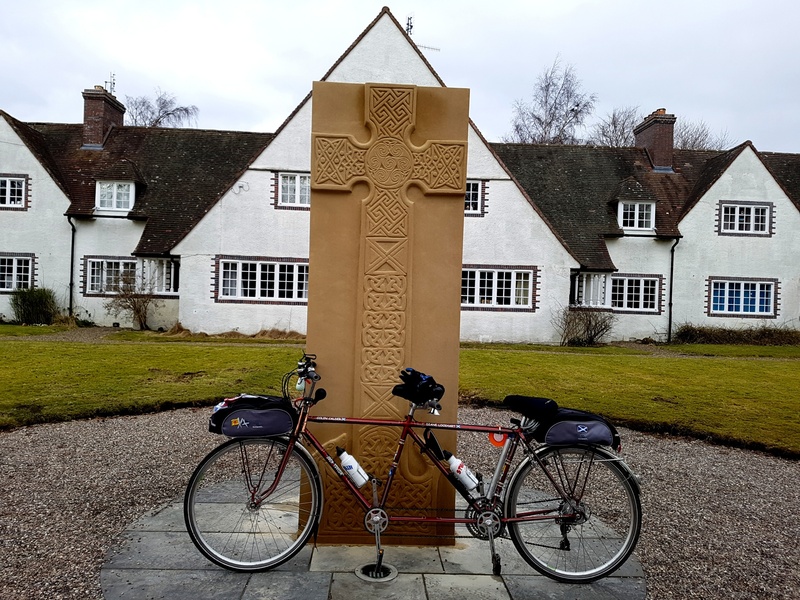 We pedalled off quickly and didn’t stop at the the last piece of local history on today’s trip – the monument to Maggie Wall. This is an eerie stone cross with a hand painted date of 1657 and it is said to be a memorial to the last witch to be burned at the stake. The return trip to Matildas Rest took just 10 minutes longer than the outward journey – which given the hills and my crew’s rustiness is a commendable effort. 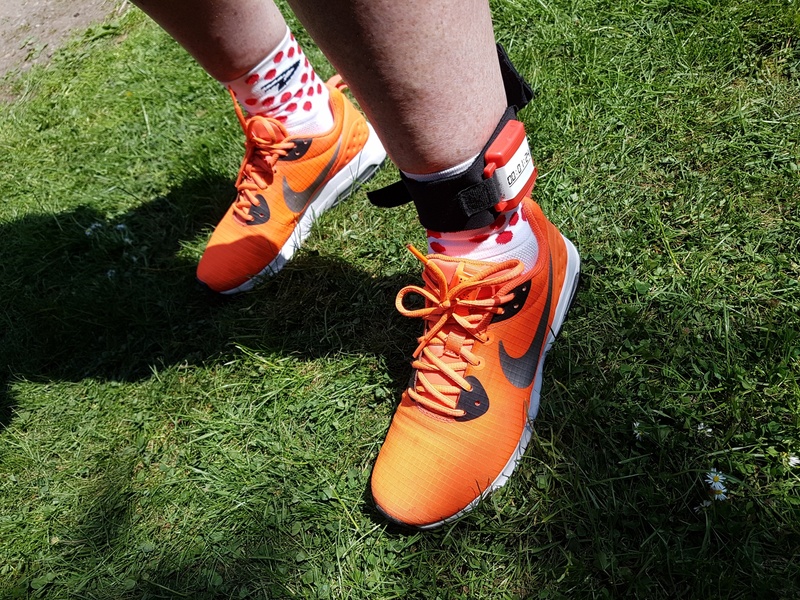 While having another warming cup of coffee the “old git” checked Strava which officially recorded the ride as being worthy of 2 gongs … amazingly we recorded a personal best and a 3rd best. My dynamic crew tandemed a distance of 15.7 miles with a moving time of 1 hour 51 minutes. As always it is the smiles not the miles that count, but our average speed was 8.5 mph and the elevation was 633 feet. 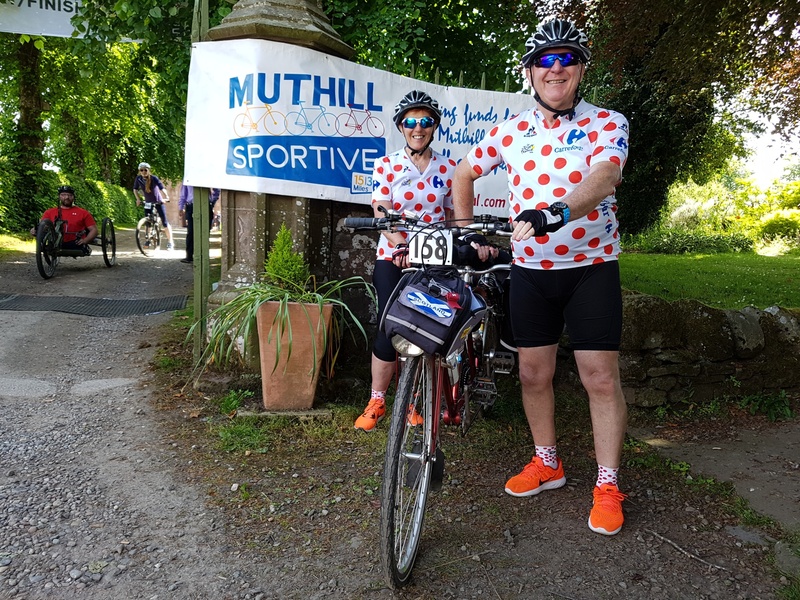 The maximum speed was 25.7 mph and Team Matilda managed to burn up 801 calories and produce an average power output of 108 W. As always the route is brought to life in our Relive 3D video – so take a look below. So the first outing of 2018 now ticked off! 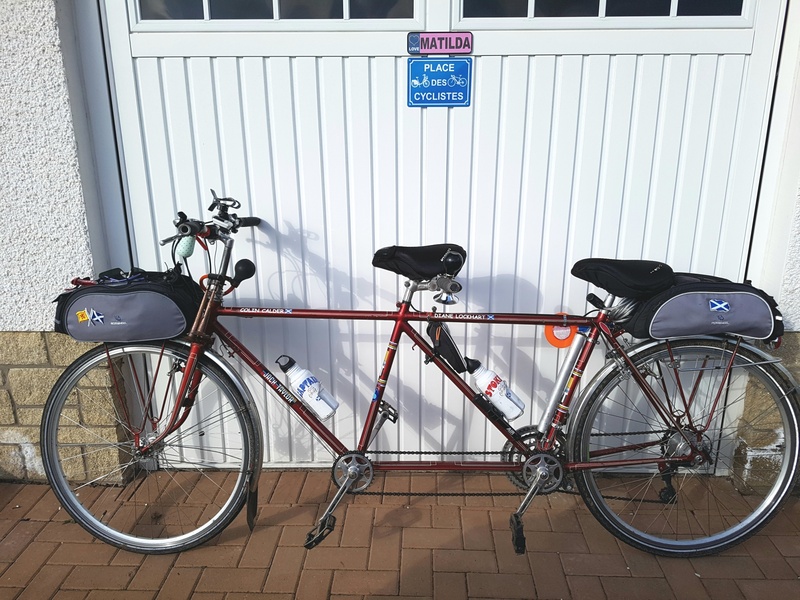 Both the “old gal” and the “old git” are hoping some warmer weather is on its way soon for sunny tandem rides! Brr! 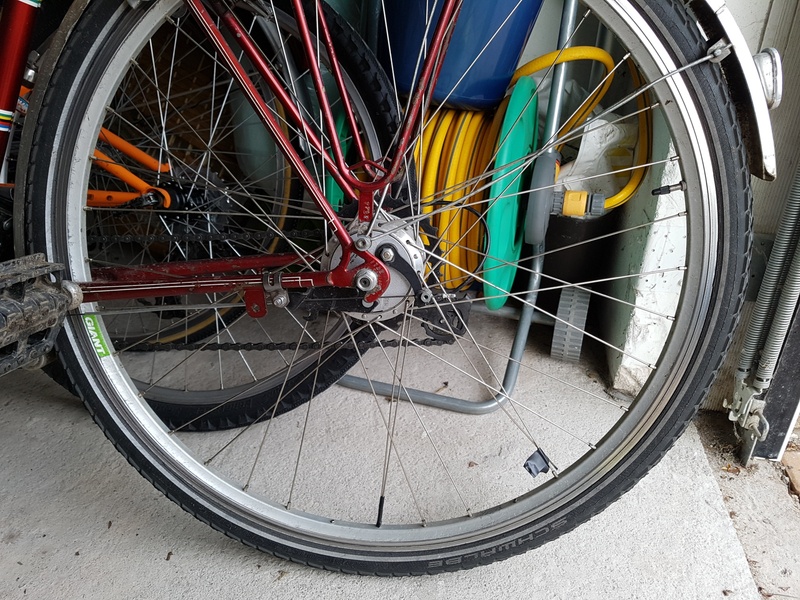 the “old gal” shivering on return … hoping for sunnier tandem days ahead!